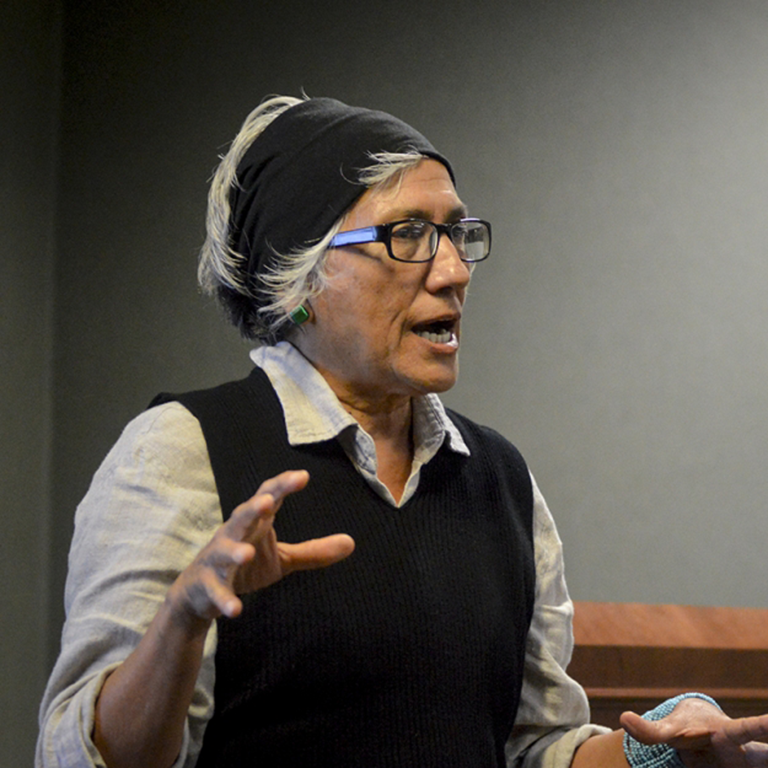 When Nora Naranjo Morse started speaking, it was at first unclear what she was communicating to the crowd gathered Friday evening in the State Room East of the Indiana Memorial Union. As she continued she switched to English and explained that she had been talking in Tewa, a Native American language spoken in New Mexico. Naranjo Morse is an expert in Pueblo culture and an award-winning writer, sculptor and producer. She visited IU on Thursday and Friday as a Phi Beta Kappa visiting scholar, spoke in classes and participated in a lunch with Hutton Honors students and the visitors at the First Nations Educational and Cultural Center. Her presentation Friday evening focused on the traditional practice of clay and pottery and their relationships with Pueblo woman. The discussion took place during Native American Heritage Month, which is commemorated throughout November. Naranjo Morse grew up working with clay. She recounted one story about her father from her childhood. Naranjo Morse said her father used binoculars to find clay in the distance. She also showed the group a documentary she helped produce on creating a clay project with the different tribes that surround hers. The video included the creation and firing of the art. It also detailed clay’s importance to Pueblo culture. Christina Burke, a curator of Native American art from the Philbrook Museum of Art in Tulsa, Oklahoma, also contributed to Naranjo Morse’s presentation. Burke and many audience members had questions about the process of collaborating to create clay projects with other tribal communities. Naranjo Morse explained the collaboration reflected the older, more traditional style of creating pottery in Pueblo culture. Naranjo Morse said pottery used to be made communally. Throughout her presentation, Naranjo Morse explained the importance of women’s role in making the pottery. She worked with her daughter on a project for SITE Santa Fe, an art center and contemporary museum. “We were making a statement about being contemporary indigenous women and art moving through this place,” Naranjo Morse said.